Special Needs - Programs working with children with special needs will require additional instructors and people to assist with supervision. If your program includes children with special needs, please be sure to include such information in your grant application. Course Access - The largest single cost a junior golf program may incur is for golf course and practice range access. However, there are many courses that will provide their facility at a significant discount to juniors. Those seeking grants (particularly those who are unfamiliar with golf) should spend significant time meeting with and negotiating their course access fees. Non golf grant writers beware - make sure you have a "golfer" to help you with pricing and negotiations. 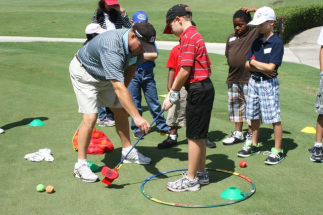 Junior golf access should be achievable for prices dramatically cheaper than adult golf. Prices should be reasonable and described in your grant request. Generally you should never pay more than $20 for a round of golf for juniors on a regulation size golf course. Clubs will often donate the use of their course during off-peak times including some school holidays that fall on Mondays when some courses close. Beginning junior golfers should rarely play more than 9-holes. 3 and 6-hole "rounds" are recommended. Range and Practice Facilities - Beginning golfers can be introduced to the game in many different settings. Perhaps the best situation for beginners is a good practice range facility that includes a short course. A good size putting green is also important. However, kids may be introduced to the game on almost any athletic field or park area. Be sure to consider the use of public parks and contact your local parks and recreation to seek access to their facilities. Similarly, golf courses owned by your city or county are often very committed to serving the public and free access for juniors should be very achievable. Golf Clubs - Golf equipment does not always have to be purchased. Many golfers have used golf clubs stored at their home and they are willing to contribute them to your program if they only knew that they were needed. A "club and bag drive" at local golf courses can generate a tremendous amount of contributed equipment. Much of the equipment can be used, some should be thrown away and some can be sold at auction to raise money. Golf club manufacturers often have last year's inventory that can be donated or sold to a junior program cheaply. Juniors can use women's clubs, seniors clubs and men's clubs depending on their age and strength. Beginners under age 12 benefit from using clubs designed for juniors such as U.S. Kids clubs and other brands. These clubs are shorter and lighter and fit young golfers well. If you must purchase new equipment, consult with your local golf professional who may be able to acquire junior clubs at wholesale for your program. Golf Balls - Used balls are available by the hundreds for free. Ask your local club to put out a box or barrel to collect old balls from their players. Put up signs at local clubs - particularly ones surrounded by homes - homeowners that live around golf courses often have buckets of lost balls just sitting in their garage. Be creative, get some golfers working on your behalf on a ball and club drive and you will find a lot of both!